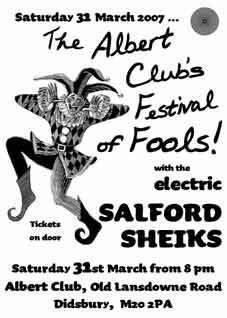 Manchester's very own Salford Sheiks are going to be appearing on Saturday 31st March at the Albert Club, Didsbury, Manchester with a feast of blues and hokum and one or two "other things". Even as you read, the Sheiks are in their R & D department perfecting their secret weapon of mass amusement; a Hawaiian / Western Swing version of "I Saw Her Standing There" by The Beatles. Could the Sheiks have such advanced technology? Oh yes, and they're not afraid to use it. The Salford Sheiks, or the S.S. as they are sometimes fondly referred to, was formed as the result of a strange Anadin induced dream experienced by Professor of Pop, C.P. Lee. C.P. first came to the public's attention as front man and singer with the wonderful 70's spoof rock band Alberos Y Lost Trios Paranoias. The Albertos found fame both in the U.K. and mainland Europe with such recordings as their hit single 'Heads Down, No Nonsense, Mindless Boogie' , and their second album 'Italians From Outer Space'. He now lectures Cultural Studies in the School of Media, Music and Performance at the University of Salford, or so he says. Other members of the band are actor and ex Albertos guitarist John Scott lead guitar, ex Victor Brox Band bass player (and bass player for everyone from B.B. King to Donovan) David B.Lunt, BBC producer and Northern Correspondent for BBC Radio 4's arts programme Front Row; Bob Dickinson, percussion and Document Records Managing Director; Gary Atkinson, second guitar. "The band has informed me that it won't take any more drugs. They've said that they won't take any less but they won't take any more".